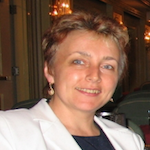 Dr. Tatiana Galaktionova is a professor of pedagogic at the St. Petersburg State University, in the Department of Philological education and educational management. Since 2001, she has also been responsible for teaching pedagogical courses in Master’s Programs, mentoring graduate students and directing PhD dissertations at the Herzen State Pedagogical University of Russia. Additionally, she is a devoted researcher and schintific advisor, with more than 100 publications deticated to different questions in the sphere of engaging school children to active reading, literacy development and implementation of CAL elements into teacher training.